Whenever anyone asks me what my favorite thing to make is, I say, “Ice Cream!” Not only is there quite a bit of science that goes into ice cream, there are endless possibilities for creating really unique flavors. I love ice cream, and yeah who doesn’t? But there is something incredibly satisfying about making your own and even though you can get a carton of strawberry ice cream at the grocery store, does it have only cream, milk, sugar, eggs and strawberries? Nope…it has about 20 other ingredients, not to mention strawberries that have no flavor, no color and no shape. Poor, poor carton of ice cream that will never live up to what comes out of my ice cream maker. This recipe for Maple Pecan Ice Cream was created to go with my Brown Butter Blondies. There is about 1 teaspoon of maple extract and the rest is all maple syrup and the flavor of freshly toasted pecans. Before one can get started making ice cream, you need to have a decent ice cream maker. I have a Cuisinart 1 quart ice cream maker with the canister you need to leave in the freezer for a day before you can whip up a creamy, frozen delight. This is kind of a drag, but it is the right price point for me and since I always keep the canister in the freezer, it’s not generally a problem…unless I want to spin 2 batches of ice cream, then I need to re freeze it. There are however, other more expensive models that you never have to freeze but they take up room on your counter and they are pretty expensive. Whatever unit you choose, the second part is learning it. I’ve worked with machines that can produce ice cream in 8-12 minutes. My machine works in about 15 minutes, which is kind of a long time, especially on a hot day when the canister might not be able to freeze the ice cream fast enough in and you get a slightly less than perfect ice cream. Either way, you might go through a few batches before you get everything just right. In a perfect situation, you will have a completely frozen canister, a slightly cooler room temperature and a completely chilled ice cream custard base. You will also need a food thermometer. I use a digital thermometer. 1. Bring the milk, brown sugar, sugar and cream to a simmer with the vanilla bean and 1 cup of pecans in a heavy sauce pot. Remove from heat, cover and steep for 30 minutes. 2. Whisk the egg yolks and maple syrup together and slowly ladle in the hot cream little by little whisking at the same time. Note: Grade B Maple Syrup has a darker flavor. Grade A is too mellow, but if it is all you have, bring it to a boil, then simmer it until it is reduced by half. This concentrates the flavor. But be careful to watch it and not let it burn! 4. Add extracts and salt. At this point, taste it. Make sure it tastes delicious to you! 5. Immediately pour custard through a strainer into a container submerged in an ice bath. This will allow the custard to cool quickly and safely. Stir occasionally until the custard is cool. 6. Remove from the ice bath, cover and refrigerate for at least 6 hours or preferably overnight. Waiting will allow the flavors to develop. 7. Pour the ice cream base into the canister of your ice cream maker and operate according to the manufacturer’s instructions. 8. Right before you stop the ice cream machine, pour in the chopped pecans and let the blade mix them in slightly. You can also, stop the machine and gently mix them in by hand if you are afraid to over-churn. Over-churned ice cream= fatty texture in your ice cream. 9. Pour into a container with a lid and freeze for at least 4 hours. Brown Butter Blondies with Chocolate Chunks soon to follow! I have to say I hate pecans but that looks delicious. I would be fine having an allergic reaction from the pecans just to try that. Thanks! But please don't put yourself in any harm just to try some ice cream! Don't worry, I'll make another flavor soon. Hi Mariel! Thanks for stopping by my blog! I'm excited to meet more bloggers in the area. (I hope to bring more food posts to my blog, too... I love cooking and baking but have trouble finding the time to do it AND post about it.) I think it would be amazing to make baking a career someday if possible and would love to hear more about how you got into it! Absolutely! 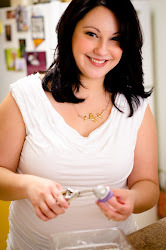 Send me an email mariel@originalcinndesserts.com and we can chat about blogging in the bay area. :) thanks for stopping by.